Musings of a Citi Sketcha: Of Price and Pen. 1. I use Sailor pens, both the ‘1911’ range and the ‘Profit’ range. 2. I use the modified Platinum ‘Preppy’ pen. The second respond is a little more complicated, as in, “How modified?” I hear you ask. I was first introduced to the pen when I purchased a bottle of Noodler's ink. The dropper-capped bottles of ink came with a complimentary fountain pen which I later found out, is the aforementioned pen. 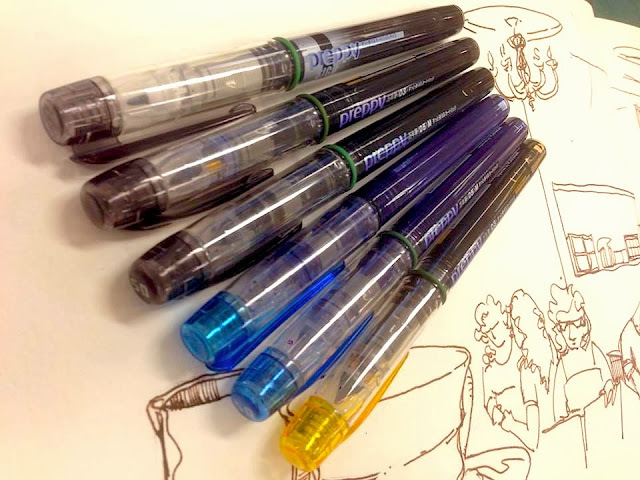 The Preppy (available at Books Kinokuniya for about S$3.00 each) is an entry-level fountain pen that is surprisingly write and draw-friendly. It comes in .3, .5 and felt tip options. They are really meant to be used with their proprietary cartridges from Platinum, but with a simple and affordable modification, you can convert the whole barrel, which is made of polycarbonate, into an ink barrel. I really love this conversion because it means I can fill the pen with copious amounts of ink. I don't really need to worry about bringing them out for sketching with me any more, since they practically last for months before needing a refill. The size 3/8 O-rings are easily available at most hardware stores. The shop I went to sells a pack of 100 for S$18 (or a crazy S$0.80 each).